Screen Rooms are a great alternative to an Open Deck! You get the joy of being outside, without the nuisances of the Great Outdoors! Bugs are no problem when you opt for a Screen Room! Texas weather is as unpredictable as it can get! It becomes difficult to plan Outdoor Events in the Spring and Early Summer months. 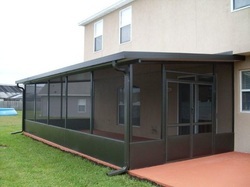 With a Screen Room, you don't have to worry about the weather! You get all the joy of being outside, without having to fight the elements! Bugs an issue for you? Not anymore! With a Sun Room, you have the ability to be Outdoors and keep the bugs away. Have a picnic without worrying about ants running off with your food! Enjoy an evening sitting Outside without getting attacked by a scourge of mosquitoes! All of our designs come with the option of removable screens, similar to how windows would work. This gives you a variety of options for entertaining! The option for leaving your screens open and letting the breeze blow through is there too! Our Contractors and Designers can give you a look that is as Fancy or as plain as you so desire! No matter how you want it to look, it will be comfortable enough to spend hours upon hours in! A Comfortable Screen Room is the perfect place to Enjoy your Morning Cup of Coffee! The perfect place to enjoy the stars without pesky mosquitoes. The perfect atmosphere for an afternoon of sipping tea or lemonade with friends!